The speed at which your product evolves hinges on how effectively you can validate your ideas. Fast, effective prototyping requires an understanding of what characteristics you are evaluating in order to tailor a solution that delightfully exceeds your expectations. Through our mastery of techniques and technologies, Designcraft provides immediate responsiveness and quick-turn precision, without sacrificing innovative insight. The speed at which your product evolves hinges on how effectively you can validate your ideas. Fast, effective prototyping requires an understanding of what characteristics you are evaluating in order to tailor a solution that delightfully exceeds your expectations. 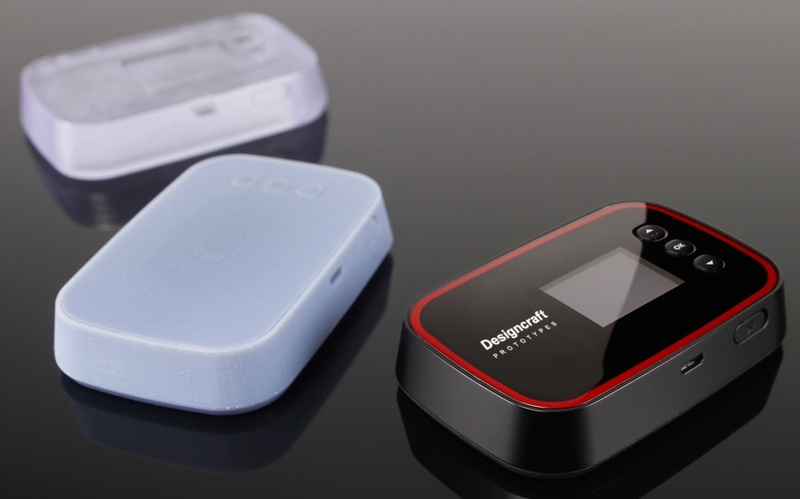 With our 35+ year history of crafting bespoke solutions, Designcraft delivers the definitive prototyping experience. Beauty is in the details, and we’re committed to making your project impress your colleagues, focus groups, and customers. Whether your parts need a quick sanding and media-blast, custom color anodizing, or showroom quality painting and graphics, our finishing capabilities are second to none. We can also add color, texture, and graphics to your production and pre-production parts that need finishing. Our Design Engineering department reviews every project that comes through our doors, providing you with start-to-finish support during all stages of your product’s development. 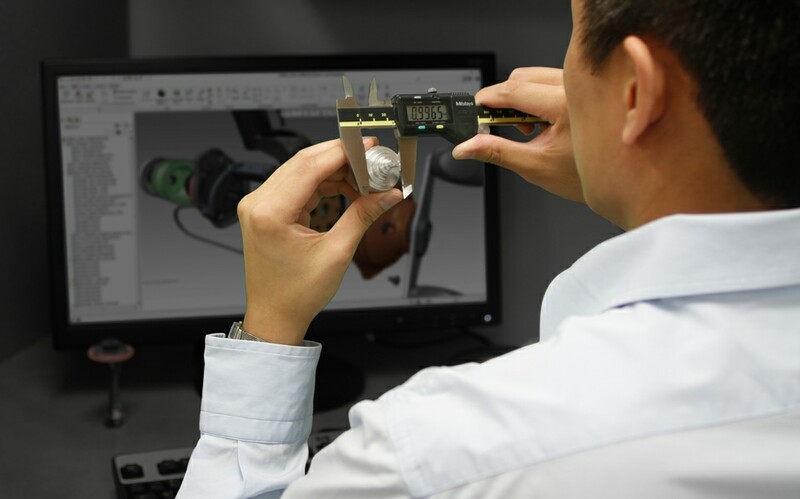 Whether it is reviewing your data for fit and function, developing concepts for a mechanism, or inspecting parts on our CMM, our Design Engineers help ensure there are no surprises when it comes to your project. CNC Machining delivers superior detail, finishing options, and functionality, over any other prototyping process. 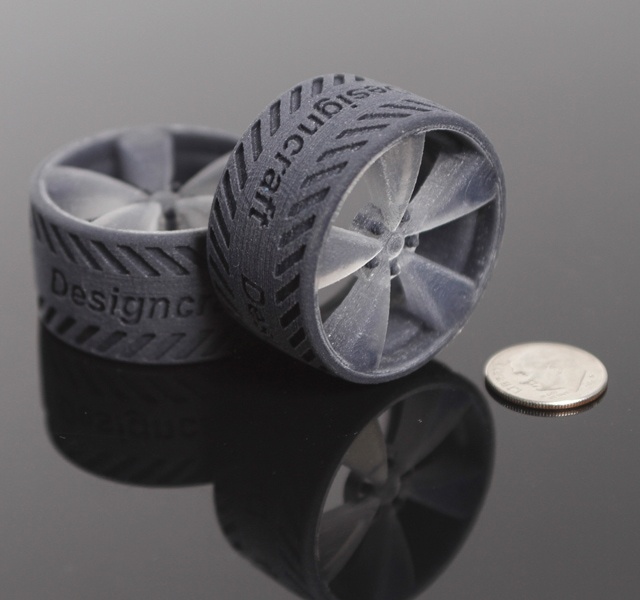 A wide variety of materials with different mechanical and visual properties means your prototypes will accurately embody the function and feel of production parts. 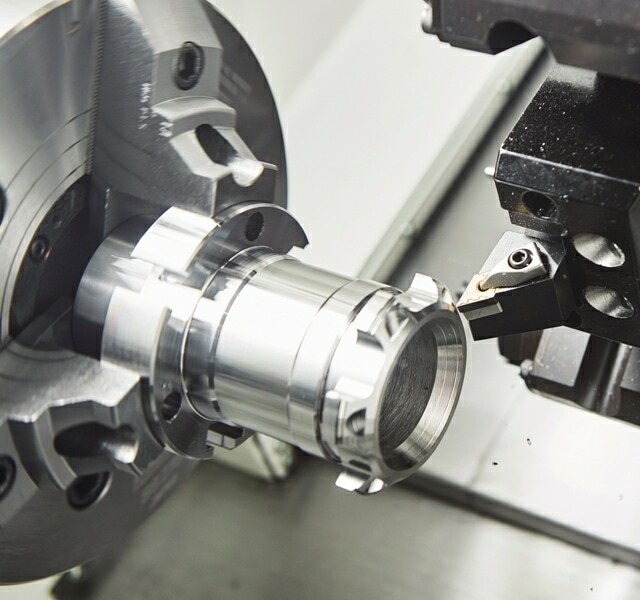 Our CNC Department is capable of multi-axis precise tolerance machining, regularly cuts details using .005” endmills, and manages tolerances of up to .0005”. CNC Machining delivers superior detail, finishing options, and functionality, over any other prototyping process. 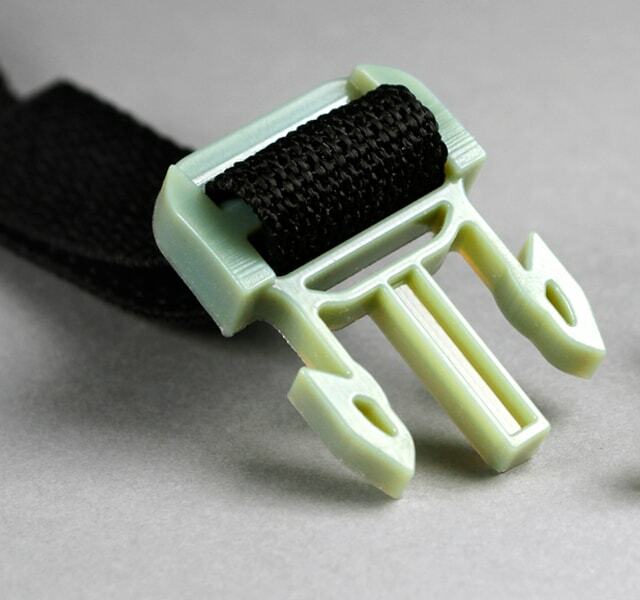 A wide variety of materials with different mechanical and visual properties means your prototypes will accurately embody the function and feel of production parts. 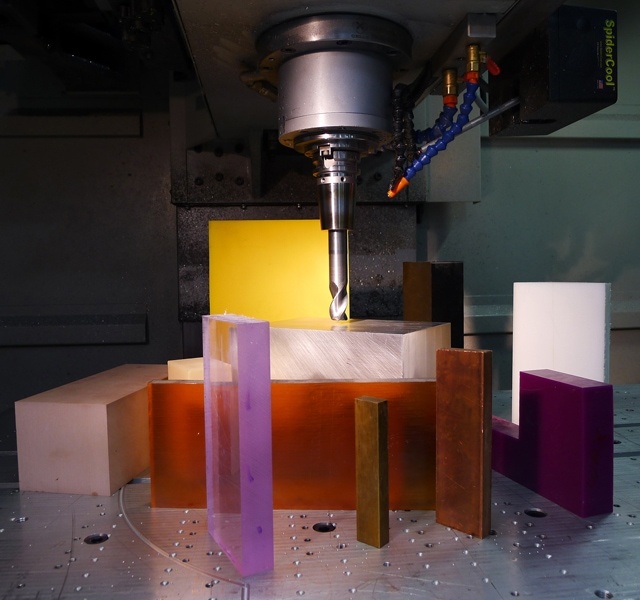 CNC Machining often allows you to use the same materials for your prototypes that will be used in production, but in a fraction of the time it takes to manufacture production parts. Our experience with unique machining situations means we execute demanding geometry right the first time, and our familiarity with metals, plastics, wood, and composites, makes for limitless possibilities. 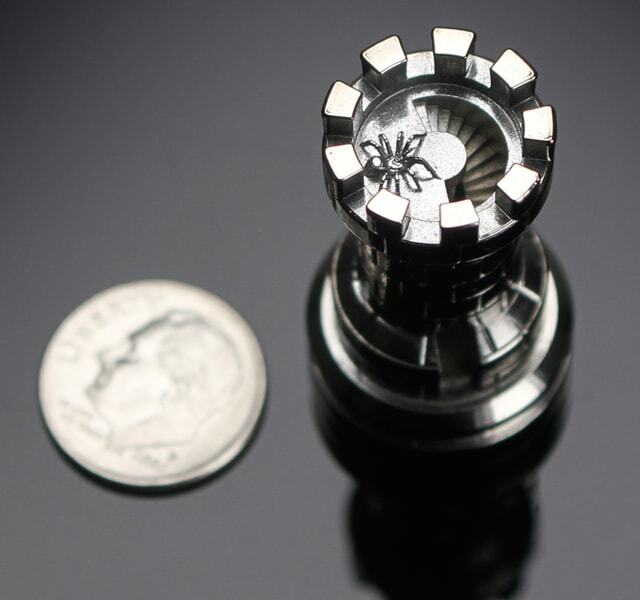 Designcraft offers state-of-the-art Multi-Axis Turn Mill Machining capabilities with one exceptional difference from our competition: you won’t run into long production lead times or high part quantity requirements. No matter how small (or large) your quantity needs are, we can accommodate your project and deliver prototype parts in a matter of days. 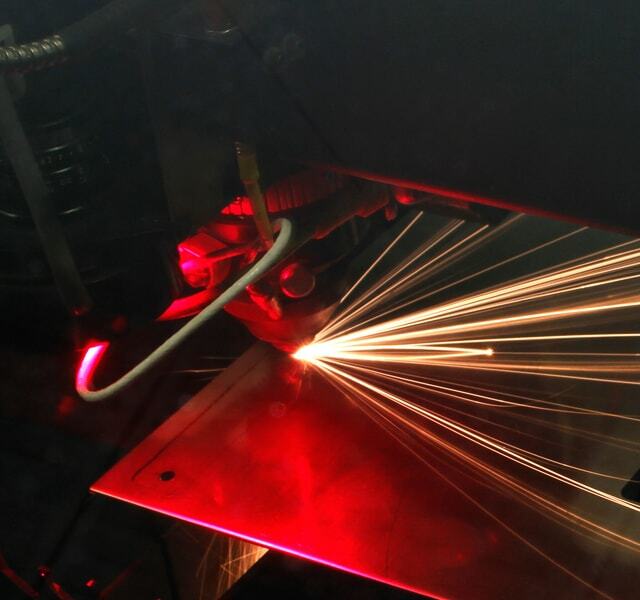 Laser Machining is fast and accurate for making profile (2D) cuts, marking text or graphics, and creating debossed artwork on a wide variety of materials. We have the flexibility to work with some very unique materials including ferrous and non-ferrous metals, plastic sheet and rod, composites, wood, adhesives and films. Designcraft can create molds that can quickly and accurately produce both urethane and silicone cast parts. The materials are available in a variety of durometers and can be custom color matched to your exact specification. This same process can be used to overmold elastomeric details on to CNC Machined or 3D printed parts. 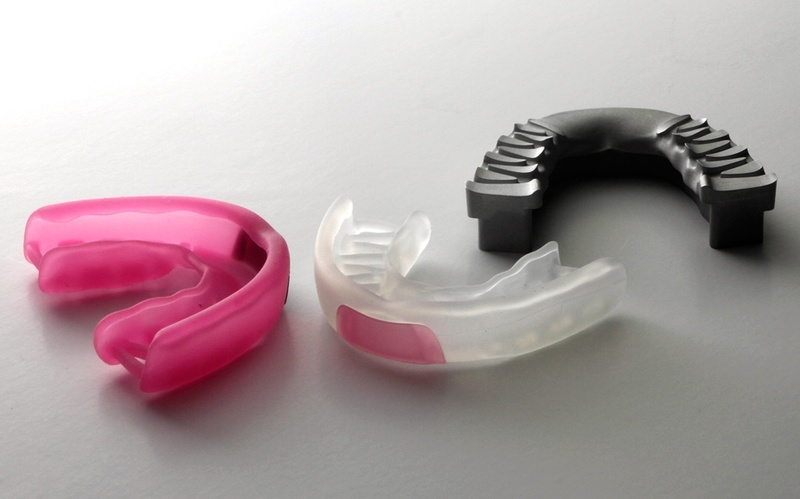 Designcraft can create molds that can quickly and accurately produce both urethane and silicone cast parts. The materials are available in a variety of durometers and can be custom color matched to your exact specification. Cast urethane prototypes are a fast, economical way for you to create multiples of a part when short-run quantities are required. These molds duplicate details and textures from the original master, giving consistent finishes from one part to the next. Available in a wide range of mechanical properties, colors, and finishes, you can have production-like results including insert and overmolding a lot faster, without investing in expensive tooling. Silicone cast parts obtained from our custom aluminum tooling process can be compared to high-volume production parts, while being completed in a fraction of the time. Production-grade silicone is available in Durometers ranging from 20 to 80 Shore A, and can be custom tinted to match your color of choice. This process can also be used to create co-molded and overmolded parts. Designcraft offers value-added services that provide you with more ways to realize your design intent while managing cost. Through painting, polishing, and full-color graphics, our Finishing department can turn your 3D Printed parts into stunning visual showpieces. From a single 3D printed master, our Casting department can replicate dozens of urethane parts in different durometers. Our Engineers can incorporate lighting, mechanisms, and functional components; furthermore, through combining technologies, we can CNC Machine delicate features that surpass the resolution of 3D printing. Designcraft offers value-added services that provide you with more ways to realize your design intent while managing cost. Through painting, polishing, and full-color graphics, our Finishing department can turn your 3D Printed parts into stunning visual showpieces. From a single 3D printed master, our Casting department can replicate dozens of urethane parts in different durometers. 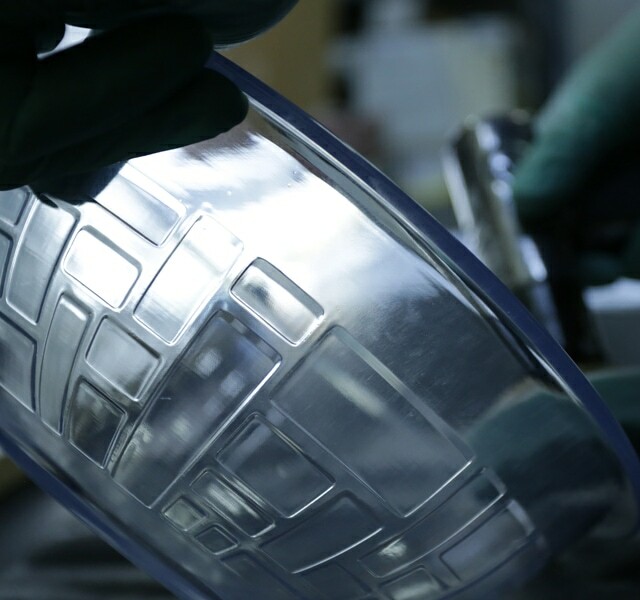 Capable of creating incredibly complex geometry, SLA can be used for detailed engineering prototypes, concept models, and even masters for silicone tooling. The material is resistant to moisture and humidity, can accommodate brass inserts, and can receive a cosmetic paint or texture. 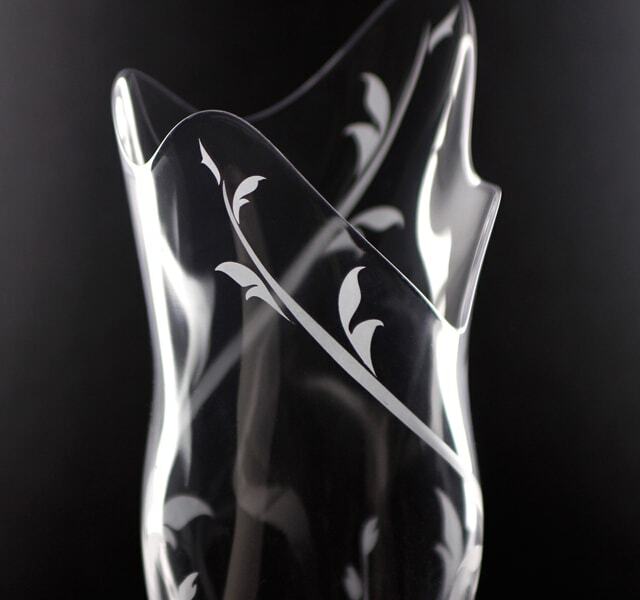 Stereolithography is an outstanding economical process for creating crystal-clear engineering prototypes and visual models. 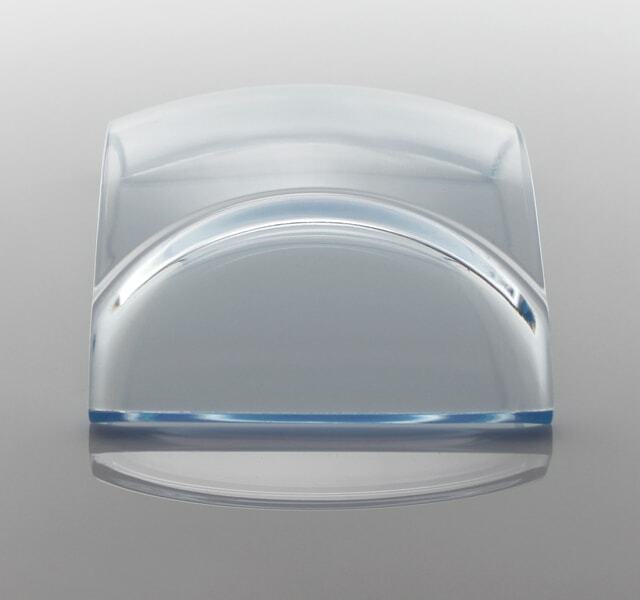 In addition to jars, bowls, and bottles, Designcraft fabricates optics, lenses, and light pipes for clients in a wide range of applications, across a variety of industries. With a 20″ x 20″ x 23″ build capacity, Designcraft’s SLA machine can generate parts much larger parts than many 3D printers. Superior resolution and surface quality reduces the amount of post-production finishing, making for a cost-effective solution. Materials can be blended into composites with predetermined visual and mechanical properties. These “Digital Materials” can simulate elastomers across the full Shore A scale and are a great way to prototype overmolding, gaskets, and grommets. Polyjet 3D Printing is produced in .0006” layers for maximum part definition and accuracy. A variety of colors and opacities are also available directly from the machine. You can even simulate ABS using our green ABS-like material. 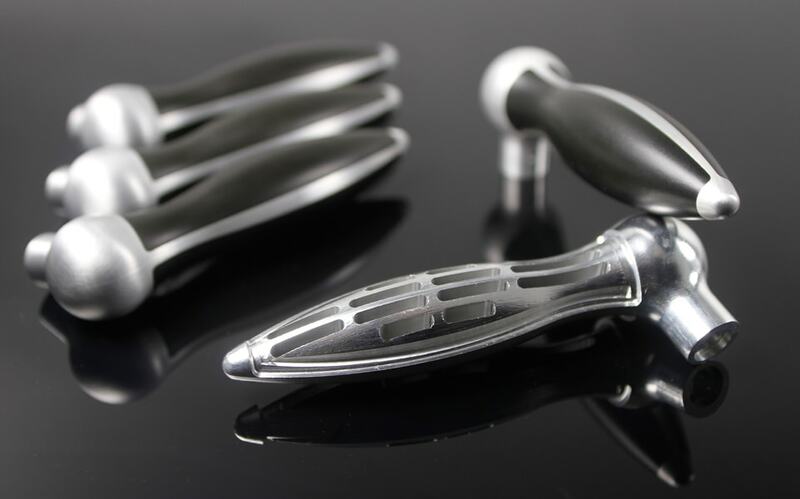 3D Printed parts can be painted, polished, textured and even plated to cosmetically look like production parts. Plating 3D printed parts is a great technique to mimic CNC Machined metal when actual material properties are not required.